Recently, Neopia was introduced to its super special Neopian Elders Day! It is a day to praise all those Neopians that have been around Neopia for years and years and years... and years. The first Neopets to be granted the honor of becoming Elders were the Ogrins, but many more are coming ahead. It is also known that many important Neopians are quite advanced in age. 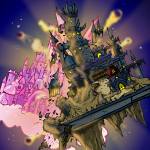 The most famous is Queen Fyora, the Faerie Queen, who has been in Neopia for... *BZZZTTTT, ouch! *... quite some time. Elderly boys and Elderly girls need special care. Their fur or scales may not be so bright, their eyesight not so sharp, but they are very much loved by their owners! This article will list the 10 items that will make your experienced pet feel more comfortable while looking through the window of his cozy neohome and heating his feet with a warm fireplace. And attention: if your pet is always yelling for other Neopets and Petpets to get out of their lawn, he/she probably is on the right way to become an Elderly Neopian! The first thing you need to turn your pet in an Elderly is, obviously, a Get Off My Lawn Paint Brush. Because you probably know that, if well treated, your Neopets will only age in time, but not in appearance. In the case you really want they show in their face how time has passed for them, this is the most important item of all. Probably it is magic, but this Paint Brush works even if your Neopet has only a few minutes of life. You can't be a happy Elderly pet if your feet keep reminding you how cold is it outside, even if you live in Sakhmet. So, to avoid purple toes and shivering, the Babaa Pyjama Slippers are the solution. They are also very helpful to make Elderly pets sleep. Just keep looking at your feet and counting one, two, one, two (or more, depending on the amount of feet) and very soon you will be falling in a very sweet sleep. This is probably going to be the food your Elderly pet will appreciate most. It is hot, delicious and it does not need to be munched! Why to make your pets tired with all the trouble of cutting and munching if you can give them food that will not demand the use of teeth? You know, maybe your elderly pets do not even have teeth anymore! A good book is always a good companion. And for your Elderly pet, reading is certainly more exciting than going to the battledome or spinning on that crazy and radical carrousel in Roo Island. And why not to give your pet an old classic about an Old Mynci that battles to fish a giant squid? If Neopia had a prize for best literature, I would say this book was a serious candidate to win. This item is perfect to be used with the previous one and with any other books your Elderly pet decide to read. Don't force your poor elderly to read small letters – give them glasses! It also makes them charming whilst protecting their delicate eyes from all the dust that comes from the yard. Ah, if at least those young neopets stopped playing gormball and making all that fuzz!! You there, if you don't take this ball away from my garden I will call the Chia Police! Better than giving your pets gloves, offer them the opportunity to have a lot of fun knitting their own pair! They will have an entertaining time for quite a while and later will have a warm pair of gloves to warm their hands. This set can also be completed with the Woolen Jumper and the Woolen Socks Knitting Set. No Elderly pet Neohome would be complete without an Old Time Wood Burning Stove. There is no need of magic or any source of crazy energy: just plain old wood and this marvelous appliance will allow your Neopet to prepare the most delicious soups broths for himself and sweet donuts for the kids. Just ask for someone younger to carry the wooden logs, please. No matter if your Neopet has two, four or zero legs. When it becomes an elderly, it will need some help to walk. The cheapest option to give this extra support to your pet is the Apple Bobbing Cane – as the name says, it can be obtained in an easy game of apple bobbing. But as to win a prize you have to bite an apple, maybe you will have to play this game for your pet. We cannot rely on their teeth for this anymore. Of course, no Elderly neopet would be happy without the perfect companion. The Kadoatie is the most appropriate Petpet for an Elderly, as it is known for being the petpet which complains most! It complains of the dark, of hunger, of cold... everything your Elderly pet probably also complains about! Get a Kadoatie and give your Neopet a friend that truly understands him! Just remember to put a big sign in front of your neohome: "Warning, Eldery Neopet with Kadoatie", because not many Neopians are strong enough to stand such a grumpy duo.